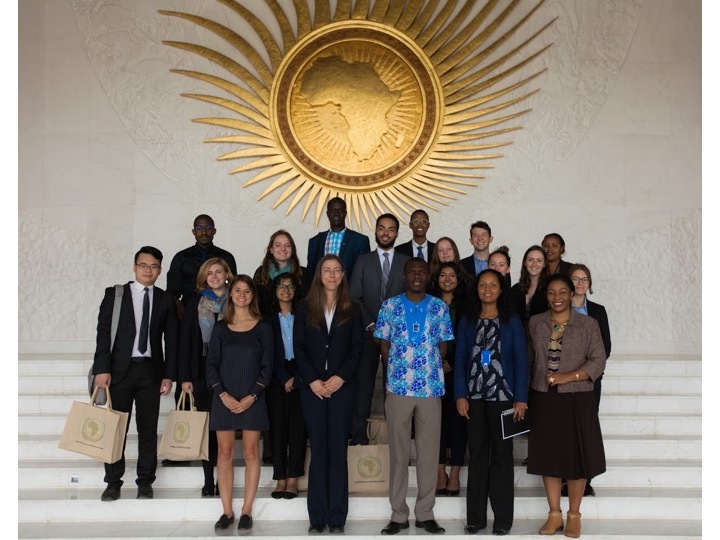 In May 2018, 18 undergraduate Political Science and International Relations students travelled to the seat of the African Union (AU) in Addis Ababa, Ethiopia, along with Political Science professors Katia Coleman and Xiaojun Li. This journey followed the students’ successful completion of POLI 464D: African Interstate Relations, a Political Science undergraduate seminar taught by Coleman that spring, which explored key actors and dynamics of contemporary African interstate politics. During the UBC-based seminar, students formed research groups and selected a contemporary African international security issue to focus on within their group. Students arranged and conducted elite interviews with African diplomats, AU officials, and other experts at the AU headquarters and affiliated organizations. This remarkable experience enabled the students to better understand how the interviewees perceived the students’ chosen security issues, and what they identified as the key obstacles to its resolution. Contemporary migration through North Africa to Europe, including AU-EU cooperation in managing this migration. The class was welcomed at the AU, the UN Office to the AU, Western and African embassies, a think-tank, and an international organization. One focus of the course was on the roles of key African states, African international organizations, major non-African states, and the United Nations in current African international politics, with an aim to help students better understand the dynamic international context within which various African countries pursue their interests and seek to address their challenges. The trip was funded through UBC’s Arts Research Abroad (ARA) program. While it has not yet been determined if this course will run again, if it does receive funding and authorization, it will be in the 2019/2020 academic year.